French High end Jewellery Maison Van Cleef & Arpels was a partner in Design Days Dubai for the fourth consecutive year in 2015. Renowned for its exceptional savoir-faire, the Maison presented Timeless Design: a high jewellery exhibition that brought together beautiful creations, combining refinement and elegance. 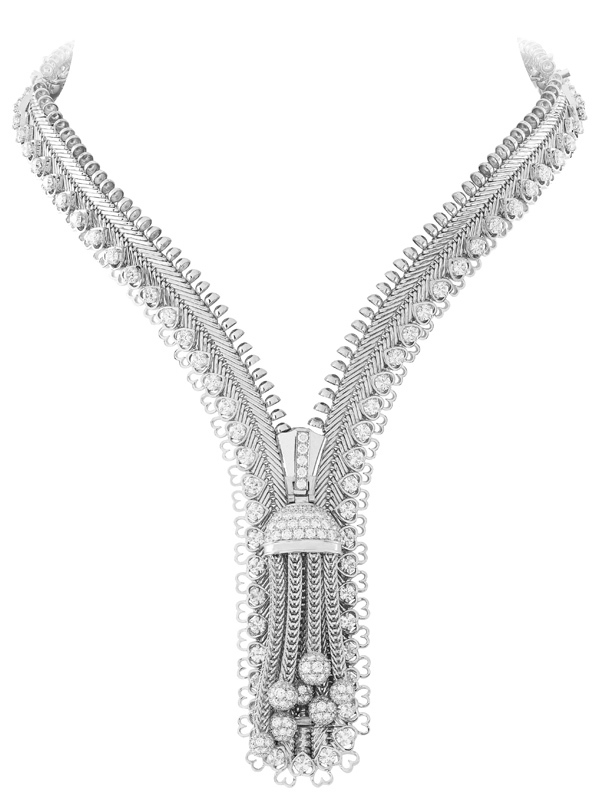 It included unique pieces from the Pierres de Caractère™ – Variations collection, along with iconic models such as the Zip necklace. To highlight the timeless elegance of the Maison’s style and patrimony, a rare selection from the Van Cleef & Arpels’ Collection was also showcased. With the Pierres de Caractère – Variations collection, the Maison paid homage to the beauty of stones, to their enchanting hues and the emotions they evoke. 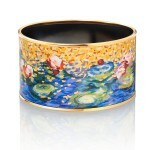 The pieces stood out as much for their rare gems as they did for their dazzling colour combinations. 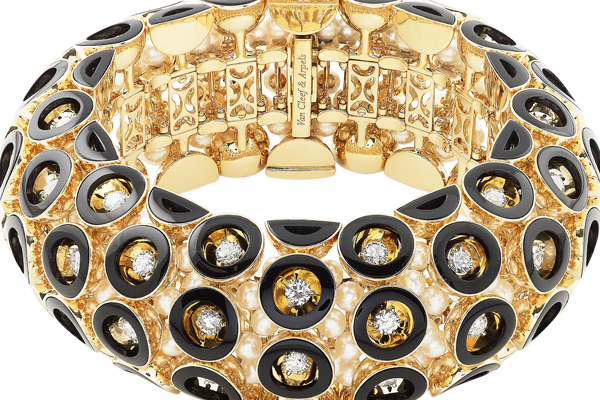 Adopted by Van Cleef & Arpels in the 1960s and 1970s, these associations of materials today inspire daring harmonies. 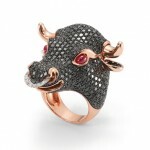 They represent new refinement in jewellery and virtuoso elegance, a harmony of boldness and excellence. The collection was also a tribute to the travels undertaken by the Arpels brothers in Asia and India between the 1950s and the 1970s: during this time they acquired exceptional coloured gems. 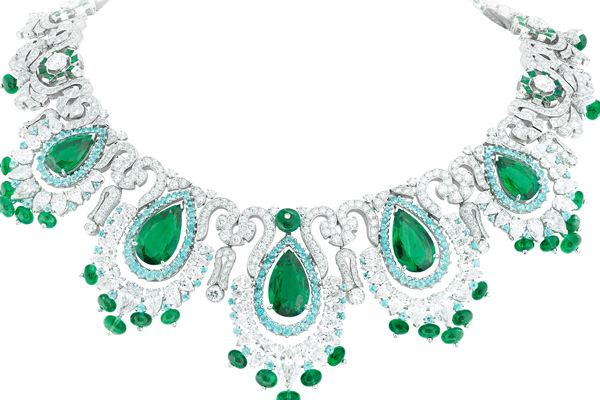 One of the major pieces of the collection, the Baia Verde necklace was crowned by an ensemble of Zambian emeralds weighing a total of 33.26 carats, highlighted by discrete borders of Paraíba-like tourmalines. Its evocative name (‘green bay’ in Italian) and colours paid homage to the verdant vegetation and turquoise waters of Portofino – a marvel of the Italian Riviera, which became a much sought after destination in the 1960s. The Mherulisa set evoked a trip to India in the footsteps of Claude and Jacques Arpels. It brought together a set of 15 cushion-cut rubies from Mozambique, for a total weight of 39.30 carats. In keeping with Van Cleef & Arpels’ tradition of transformable pieces, the necklace and earrings could be worn in more than one way, since the white pearl motifs were detachable. The Perles Mystérieuses necklace revealed a rich association of materials: sapphires, diamonds, turquoise and cultured pearls. 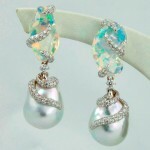 The latter hung delicately on Mystery Set motifs, creating an elegant harmony from white to blue. With its association of diamonds, yellow sapphires and spessartite garnets, the Rayons Précieux set displayed a dazzling gradation of solar hues. This rare variety of garnet is renowned for its vivid orange colour, which illuminated the necklace and the earrings. Another exceptional piece was the Solitaire Deva ring, in platinum, set with one pear-shaped DFL diamond of 12.54 carats. With its creative setting, it was adorned with a unique stone that made the heart beat faster and instilled a unique emotion. The Maison also presented iconic pieces such as the Zip Antique Confettis Sapphires necklace, honouring the innovative design of the Zip necklace – first created in 1950 from the suggestion of the Duchess of Windsor. In white gold, this transformable creation combined round diamonds, round sapphires and sapphire beads. Historical objects related to art and design formed a highlight of the exhibition. Since the 1910s, Van Cleef & Arpels has created numerous precious and sophisticated objects that are more than utilitarian; they are true works of decorative art. Each piece presented at Design Days Dubai was selected with a curatorial eye for art historical significance, imaginative design, strong craftsmanship, taste and, ultimately, beauty. One exceptional piece was the model of the Varuna yacht, equipped with an electrical contact for a butler’s bell. 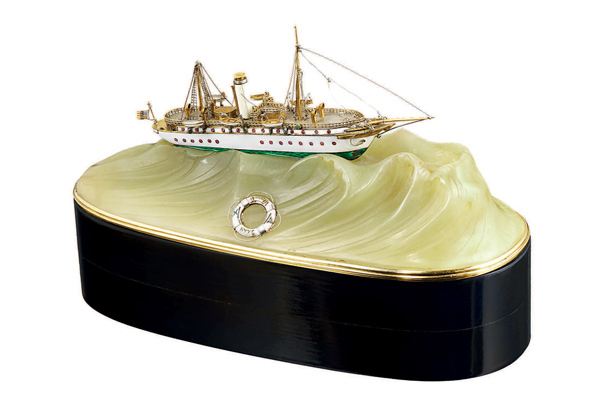 This small-scale model of the yacht Varuna of New York was created circa 1908. The real schooner belonged to an American commodore, heir to an immense fortune and a leading figure of New York. 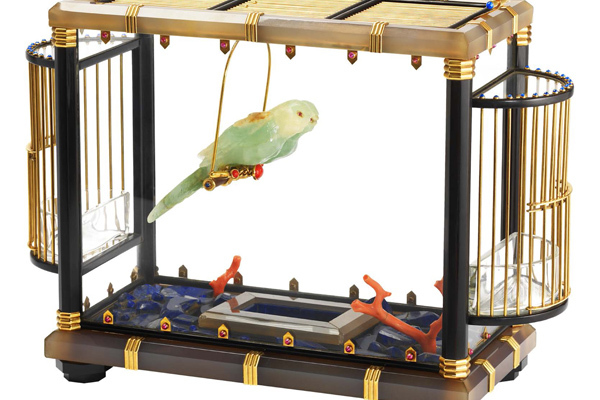 Designed to rest on a table, it was originally electrically wired to call the butler. The High end Jewellery exhibition was accompanied by a unique creation by the talented emerging designer Ivan Parati, who was selected from the entire region in a competition organised in collaboration with Tashkeel and Design Days Dubai. The finalists of the Middle East Emergent Artist Prize competition addressed the theme of Functional and Conceptual Design, providing an exploration of the dynamics between natural and industrial elements inspired by the interplay between form, function and aesthetics. Van Cleef & Arpels presented the winning creation Tiletable at the exhibition. Lovers of beauty had the opportunity to witness first-hand the refined craftsmanship and meticulous skills of the Van Cleef & Arpels’ expert master craftsmen – the Mains d’Or – during a live workshop at the exhibition. The Jewellery workshop offered an exceptional opportunity to explore the intricate techniques of High Jewellery, including waxing and polishing. Visitors were also invited to follow a gemstone’s progress through the technique of stone setting. This hands-on experience allowed them to appreciate all the richness of this savoir-faire.